Macclesfield is in the middle of nowhere, however, it is next to a motorway but the official coaches decided a trip around the countryside would be better than the motorway which would have shaved an hour of the trip which included a rather unnessacery 15 minute stop in leek for a toilet break even though there was a toilet on the coach. Maccs ground isn't exactly the biggest and it hard to spot it until you were quite literally at it's gates. Around the ground there are a few things that would interest various types of people such as pubs, museums and a lot of other random things but you won't get time unless you go early. The weather on the day was terrible and when you were on the coach, you could just see how wet you were going to get on the terrace. The day's weather was very changeable going from rain, to snow, to sleet and then back to rain again, oh what a lovely day. Going into the ground is as straight forward as you get with the simple turnstile system but then you're encountered with a rather steep staircase to get to the terrace, there is no other way of getting onto it if you're disabiled, it is recommended you go into the seated away end but we'll get to that in a bit. The view from the terrace could be better and in similar stand to Boston's away end, you can't see the goalline as it is blocked by advertising hoardings. The pitch is quite small so it's quite easy to see what goes on at the other end of the ground although the lack of an evelated position means you can really get a clean view of any goalmouth scambles that happen at that end. 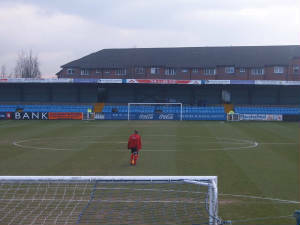 The stand to our right was a fairly small seated stand which is a similar size to Chester's side stand but with blue seats and a white pattern which appears to be a logo of somekind. The executive boxes are directly above the seats. The stand opposite is another terrace, however, in a rather clever idea, they've got a section of seating in front of the terrace meaning that if you wanted to sit down then you don't have to worry about all those who are stood up becuase they're behind you and can't bloke your view. 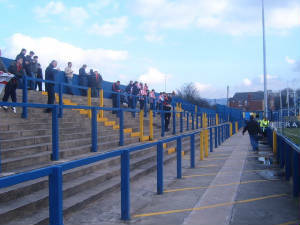 The final stand is a smaller version of Bristol Rover's main stand. 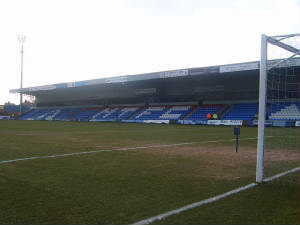 It is a pitch length terrace with a very very small section of seating cover 1/3 of the pitch above the middle section the stand. 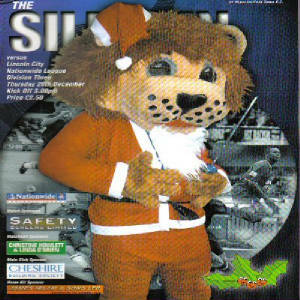 The programme was quite decent although the main problem returned with too many adverts being inside. 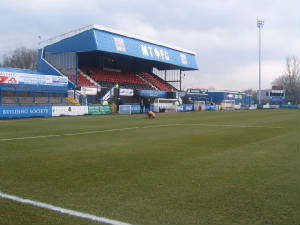 Overall I had an average view of Macclesfield, it wasn't a great ground or day out but it wasn't bad either, however, whether I would want to go watch a random game there if City weren't playing would be hard to decide and would get the more than likely answer of no.